PARIS — Europe's fourth Automated Transfer Vehicle pulled into port at the International Space Station on Saturday (June 15), delivering a hefty load of supplies, including rocket fuel, experiments, food and clothing for the lab's six-person crew. The 20-ton spaceship, named for physicist Albert Einstein, docked with the space station's Russian service module at 10:07 a.m. EDT (1407 GMT) after a glacial automated approach guided by high-tech lasers and cameras. "Thanks to the ground teams," Italian astronaut Luca Parmitano posted on his Twitter account. "ATV docking was really easy. Now the hard job begins: unpacking everything!" The cargo ship blasted off on an Ariane 5 rocket from French Guiana on June 5, beginning a 10-day pursuit of the space station. 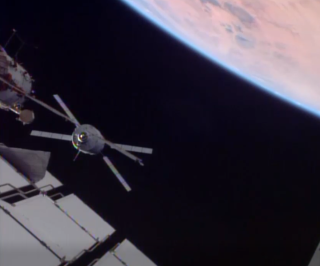 A Russian Progress supply freighter left the space station Tuesday, clearing the aft port of the Zvezda service module for the arrival of the Albert Einstein spacecraft. The ATV hauled seven tons of payload to the space station, including 5,465 pounds (2,479 kilograms) of supplies stowed inside the craft's cargo cabin. The materials include food — tiramisu, lasagna, parmesan and other meals — along with experiments, clothing and spare parts. "With the fourth ATV now ready to support and supply the space station with essential supplies and scientific experiments, ESA again proves itself to be a reliable partner in the international station upon which the future can be developed," said Jean-Jacques Dordain, director general of the European Space Agency. Astronauts will open the hatches between Zvezda and the cargo ship Monday, with unpacking of the ATV's pressurized compartment due to begin Tuesday. Technicians loaded the ATV's cargo hold with 209 bags containing 1,400 items, which will take several weeks for the crew to move and store inside the space station. Most of the supplies are for NASA, which uses resupply craft owned by Europe and Japan in a barter arrangement. The European Space Agency and Japan Aerospace Exploration Agency pay for their share of the space station's operating costs through cargo services instead of cash. ESA says each ATV mission costs 450 million euros, or about $600 million. Europe's fourth ATV approaches the International Space Station on June 15, 2013. The cargo includes a toolbox made with a 3D printer and an experiment to investigate the way emulsions — droplets suspended in a liquid — behave in microgravity. Emulsions are used in a range of applications on Earth, particularly foods like salad dressings and mayonnaise, according to scientists. Built by EADS Astrium, also prime contractor for the ATV and Ariane 5 launch vehicle, the emulsion experiment will be installed by astronauts into the fluid science lab inside the European Columbus module on the space station, beginning up to eight months of experimentation using a microscope and differential scanning calorimeter. The Albert Einstein mission also carries a fresh microscope for a European Biolab science rack, a cooling servicer, and a 176-pound (80 kg) spare water pump for the Columbus lab module. NASA furnished a ride for a water recycling device for the space station's life support system, which purifies urine into drinking water in a closed-loop system. The ATV's cargo hold also contains bags with a new GPS antenna for Japan's Kibo module, and a fresh stock of gas masks to replace old ones on the space station. While unloading of the ATV's dry cargo will be done manually, the rest of the the ship's supply load — comprising fuel, air and water — will be pumped into the space station. ATV 4 also delivered 1,245 pounds (565 kg) of water and 220 pounds (100 kg) of air and pure oxygen to revitalize the station's atmosphere. At the end of its mission, the European freighter will be transformed into garbage truck as astronauts load tons of trash and old equipment into the ATV before it leaves the space station in late October. Controllers will put the craft on a trajectory to burn up during re-entry over the Pacific Ocean. One more Automated Transfer Vehicle is being constructed by Astrium for launch to the space station in June 2014. ESA and NASA signed an agreement in January to merge the ATV program with the U.S. Orion crew vehicle, which will take astronauts on journeys to deep space beginning in the 2020s. Europe is providing a modified ATV service module for the Orion spacecraft's unmanned test flight in 2017, plus components for a manned mission in 2021. ESA could build service modules for further Orion missions if the agreement is expanded. "Such a gentle contact between a spacecraft the size of a double-decker bus and a Station 20 times larger is an amazing achievement, highlighting the impressive level of control achieved by this European space system developed by our industry under ESA's direction," said Thomas Reiter, ESA's director of human spaceflight and operations. "These impressive technological capabilities will live on in the service module of NASA's upcoming Orion crew vehicle."